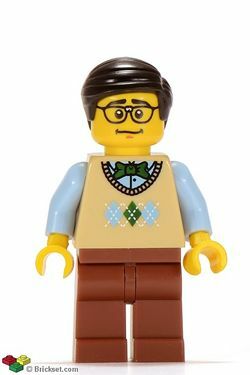 The Computer Programmer is a Collectable Minifigure released in 2012 as one of the sixteen minifigures from 8831 Minifigures Series 7. His torso has a tan vest with a blue shirt and bowtie underneath. He comes with a printed mug with the C drive image on it and a dark grey laptop. He is the first minifigure in LEGO history to have a printed cup piece. The printing on the cup features the characters used in the directory path of the C drive C:\ , the main hard drive on most Windows computers. The mould of the Computer Programmer's hair piece is the same as the one used on the latest Robin and Obi-Wan Kenobi (Jedi Master) minifigures. If you look closely, you can see that his glasses have been repaired with some tape. He comes with a dark grey laptop that opens and closes.